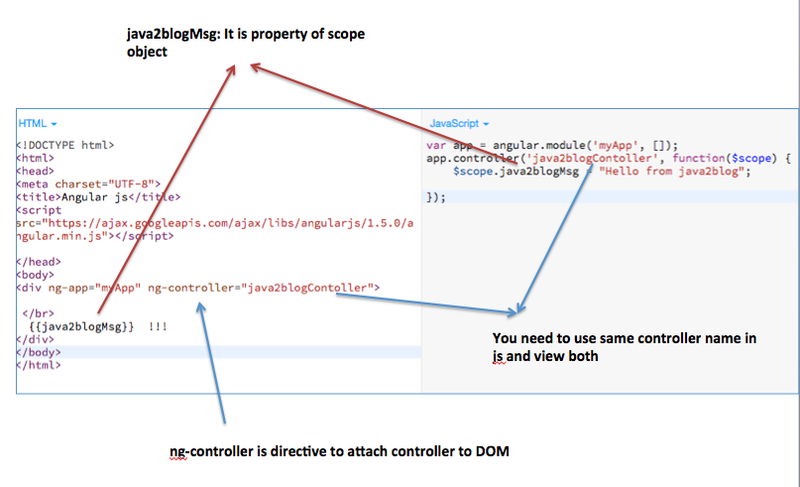 In previous post, we have seen a very simple angularjs hello world example. In this post, we are going to see about controllers. Scope is an object which is glue between model and view. So if you want to pass data from model to view and view to model, it is done through scopes object. How controllers and scope are related? Actually controllers passes scope object as constructor parameter and initialise model values and functions. Please don’t worry if it sounds very confusing, once we see simple example, you will be able to relate. You need declare module before creating controller. We will learn about module in our next tutorial. So we use module’s controller method to declare controller. Copy below text , open notepad , paste it and save it as angularJSControllerExample.html and open it in the browser. What if you don’t want to use $scope? Yes, you can use controller as option too if you do not want to use $scope variable. It removes dealing with this scope and bindings.